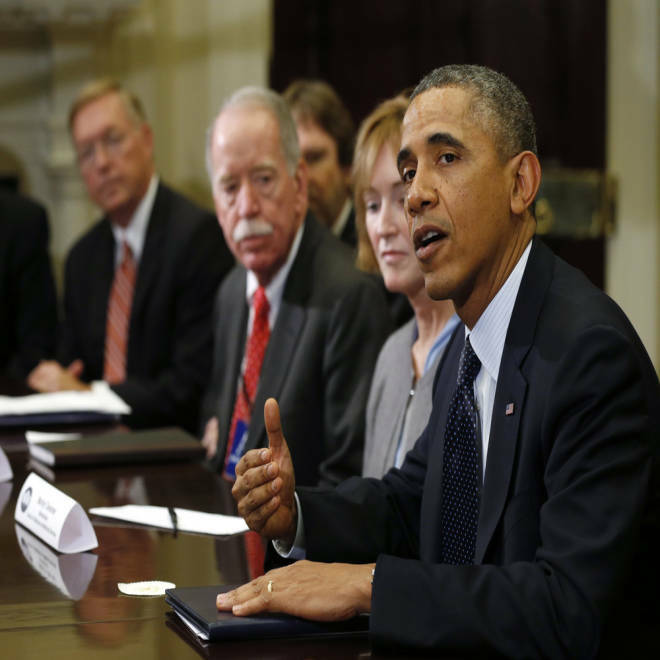 President Barack Obama meets with health insurance executives at the White House on Friday. Several insurance industry officials and state insurance commissioners expressed frustration Friday, saying they were “baffled” by President Barack Obama’s assertion that the cancellation of millions of insurance policies occurred because a key provision of the Affordable Care Act didn’t work as expected. The administration was warned three years ago that regulations would have exactly that effect, they said. They said the widespread cancellations in the individual health insurance market — roughly 5 million and counting -- are in line with what was projected under regulations drawn up by the administration in 2010, requirements that both insurers and businesses objected to at the time. Cancellations also are occurring in the small group market, which covers businesses with between two and 50 employees, they noted. At issue is a so-called “grandfather” clause in the law stating that consumers would have the option of keeping policies in effect as of March 23, 2010, even if they didn’t meet requirements of the new health care law. But the Department of Health and Human Services then wrote regulations that narrowed that provision, saying that if any part of a policy was significantly changed after that date — the deductible, co-pay, or benefits, for example — the policy would not be grandfathered. Asked why he continued to say that when estimates from his own administration suggested millions of Americans would not be able to keep their insurance, Obama replied, “There is no doubt that the way I put that forward unequivocally ended up not being accurate. It was not because of my intention not to deliver on that commitment and that promise. We put a grandfather clause into the law but it was insufficient." To fix the problem, Obama said that he would give health insurance plans the option to keep selling plans that don't comply with Obamacare for one more year, effectively shifting the decision to insurers and state insurance commissioners. In comments filed in August and December 2010, America’s Health Insurance Plans -- a trade group representing 1,300 insurance plans — urged the administration to “reconsider” grandfathering rules because they were too stringent to allow many to keep their policies. In the first round of comments, AHIP stated that under the administration’s proposed regulations, “The percentage of individual market policies losing grandfathered status … will likely exceed the 40-67 percent range” and warned that could cause “disruptions” for those who wish to keep their policies. The individual market is made up of approximately 15 million Americans who purchase health insurance on their own. If 40 percent of those consumers lose their policies, that would work out to 6 million cancellations. During the same period, consumer groups complained that the administration’s rules were too lenient and would allow too many Americans to keep substandard policies that didn’t meet the new standards of the Affordable Care Act. “Specifically, insurers offering these renewals must inform all consumers who either already have or will receive cancellation letters about the protections their renewed plan will not include and how they can learn about the new options available to them through the marketplaces, which will offer better protections and possible financial assistance,” said the official, also speaking on condition of anonymity. Insurance commissioners from California, Florida, Kentucky and North Carolina said Friday they would move quickly to implement the president’s request. Florida Insurance Commission Kevin McCarty said most insurers in his state already had voluntarily extended coverage for those impacted. Other state insurance officials suggested it may be too late in the game to change the rules.